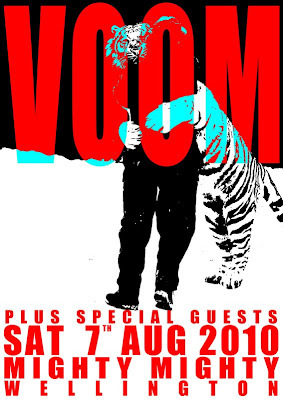 Since it's first release in 2002, Lil' Chief Records has developed a reputation in New Zealand and to a certain extent across the globe for consistently releasing great pop albums. Much like the Beach Boys best material, a lot of the Lil' Chief releases seem to have some kind of "Pop Mastermind" behind them, acting as a songwriter, arranger and producer all in one. I think it would be safe to say that perhaps more than any other band, The Beach Boys recordings from the early 60s right through to the early 70s are of great influence to many of the artists on the label, as they are to pop songwriters and producers around the world. However, somewhat overlooked I believe - are some of their later recordings. During the 80s and early 90s the Beach Boys underwent a Bowie-esque transformation, ditching their tired old arrangements for a sleek and more modern sound. Their once dry and dare I say pathetic drum sound was replaced by a brighter, more bombastic and danceable sounding kit. Rather female sounding instruments like the celeste, harpsichord, and real strings (which should really only ever be used when making childrens music or homosexual music) were replaced with professional and digital sounding synthesizers, producing a more masculine and mature sound. One of the first albums to be recorded, edited and mixed entirely on Pro Tools was the much underrated masterpiece 'Summer in Paradise' by The Beach Boys. Although it bankrupted their record label, their 27th studio album - the criminally out-of-print 'Summer in Paradise' established The Beach Boys as pioneers of digital recording, and takes it's place alongside Brian Eno's 'Another Green World', or Kraftwerk's 'Trans Europe Express' as a historical moment in the modernisation of pop music in the 20th century. Although short-lived, Brian Wilson's foray into Hip Hop Music in the early 90s epitomises for me, the Beach Boys versatility and pioneering spirit. While rap music by nature should only be created / listened to by Black People, Brian Wilson, a middle aged white male, paved the way for future white hip hop artists, (notably Marshall Mathers) when he released 'Smart Girls', arguably one of his greatest lyrical achievements and what has been described by critics as 'the pinnacle of both hip hop and feminism'. In keeping with the Beach Boys spirit of development and change, many of the later Lil' Chief releases are incorporating more electronic elements, capitalising on the benefits of the digital age (The Ruby Suns - Fight Softly, Little Pictures - Owl & Owl, Pikachunes - S/T). Inspired by the transformation of the Beach Boys from Melodically-Safe Surfer Dudes to Utterly Dangerous Synthesizer Bad-Boys - Lil' Chief Records and the artists on our roster hope to continue releasing forward thinking Nu-Pop and maintain our reputation as one of the best and most original pop labels in the world. Here's a much simpler way to listen to Sexual Angel by Golden Axe ft. Princess Chelsea. Phew. It's a tiny bit complicated, but still worth it. 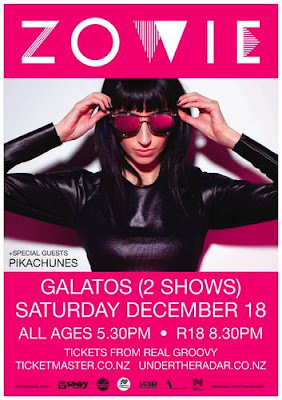 Pikachunes supporting Zowie, twiiice in the same night. Pikachunes is playing with Zowie this Saturday at Galatos in Auckland, ooh la la. 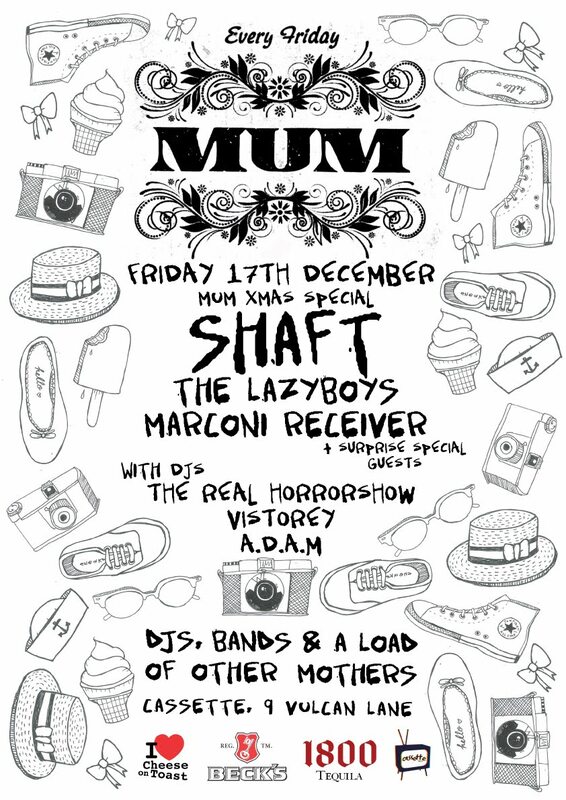 Get your tickets from Real Groovy, www.ticketmaster.co.nz or www.undertheradar.co.nz. Lil' Chief's own lovable indie rockers, Shaft, are playing this Friday the 17th at the MUM Christmas special at Cassette 9. Playing with them is Marconi Receiver, aka label-mate Tamasin from the Nudie Suits and Pie Warmer. Fun fun fun. Not really that probing, but still quite nice to watch. Cheese on Toast also reviewed the album here, have a read. 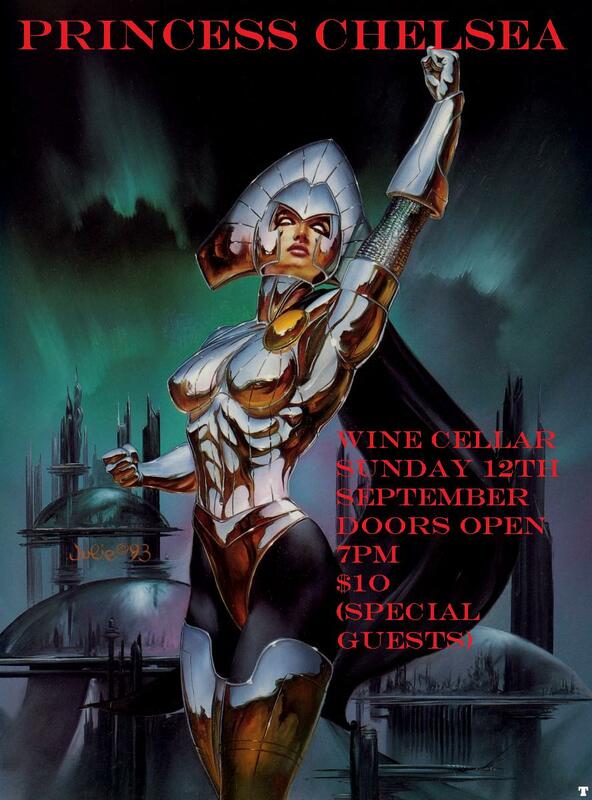 We are playing a show with Fabulous Diamonds and Sam Hamilton this Friday the 10th at the Wine Cellar. Fabulous Diamonds are this great band from Australia, it's a girl (on drums) and a guy on keys, they both sing. Pitchfork describes it as "head spinny" maybe you can decide for yourself here. I heard their second CD in a record store when I was in Sydney and liked it so much I bought it on the spot. We have a song on the A Very Little Christmas, a Christmas compilation album with a whole bunch of songs from lots of different artists including Bearcat, Bannerman, the Crawley Christmas Singers, Timothy Blackman, the Artisan Guns, Cool Rainbows and heaps more. You can download it for free here from the 6th of December. So much Lil Chief goodness in December! 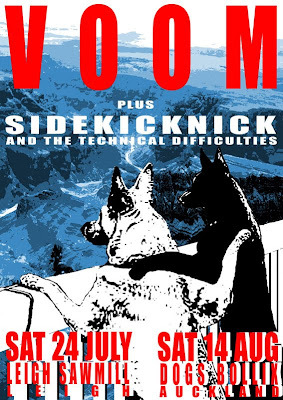 'Soul rockers' Voom, the band responsible for one of NZ's "100 Essential Albums" (according to Nick Bollinger) are playing a show very very soon - don't miss out! Click here for a (freely downloadable!) sample of the night. Dec 10th - Dogs Bollix, Auckland (w/ Night Choir). 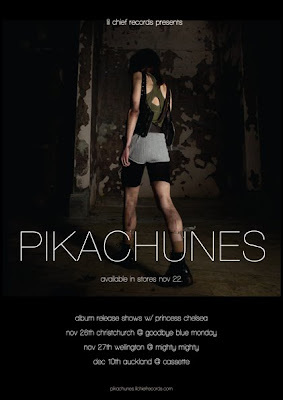 Pikachunes' debut album is out now and available for purchase! 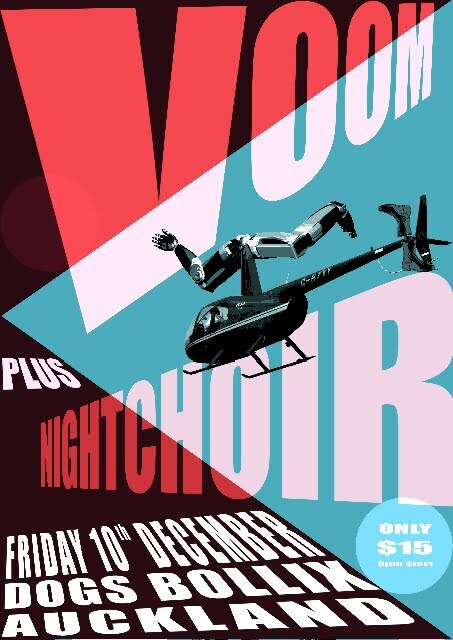 Initial reviews have been glowing, with local sites Cheese on Toast and Einstein Music Journal using language like "stunning", "charming", "nervously charismatic", "euphoric", and "awash with heavy club thuggery". Get it here as an actual honest-to-god CD here, or in digital form here. Here's a pretty video for the lovely Two Humans by The Ruby Suns. Nice and summery for those of us in the southern hemisphere! Our very own Edmund Cake (of Edmund Cake/Pie Warmer fame) was recently involved in a rather nasty auto-mobile accident. 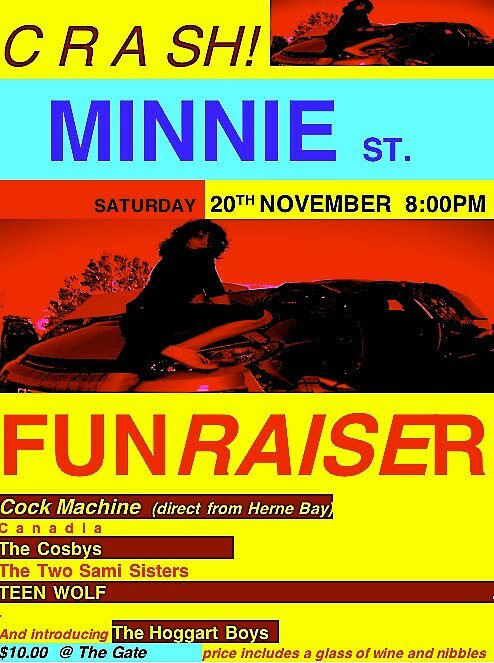 To help him out a little, come to the Crash Fun-raiser, and hear some nice tunes from several fine bands including the legendary Cosbys (watch this space, ahem) and Teen Wolf, featuring the lovely (Princess) Chelsea. Hurrah. I have just uploaded a free download of my Beatles Cover for you. That's right, The Ruby Suns are soon to be winging their way home from touring the wide world in support of their new album Fight Softly. 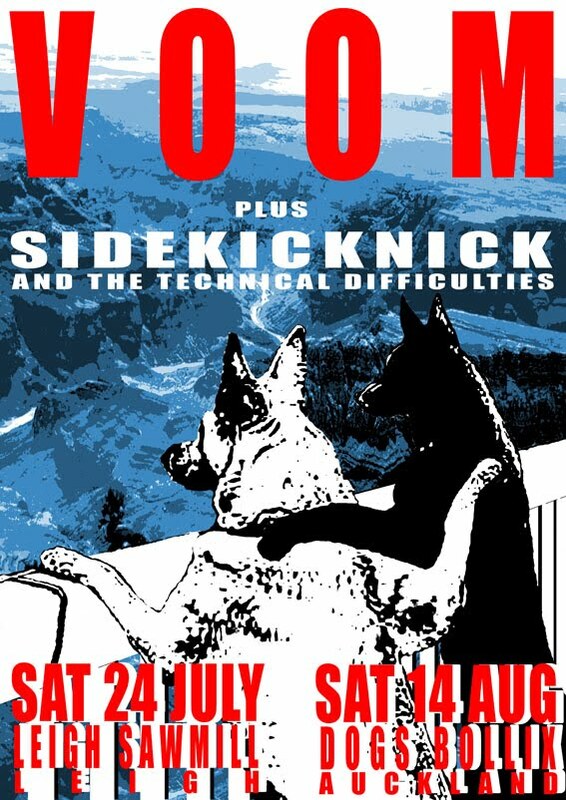 Sliding straight out of one summer and (hopefully) into the next, they'll be conjuring up some warm weather vibes in late November with just two North Island shows. 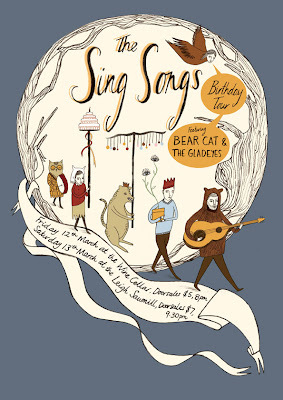 Catch up on their tour hijinks here: twitter.com/therubysuns. Lil' Chief Records is pleased to present our very newest signing - jazz student turned bedroom producer Pikachunes. Former Tiger Tones member Miles McDougall has been spending some serious one-on-one time with his laptop and a drum machine, and has emerged with a compelling blend of atypical disco beats, grooving synth lines and a strong pop sensibility. 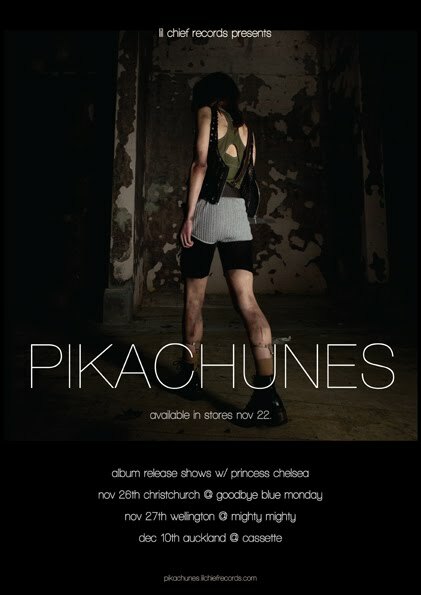 Pikachunes' self-titled debut album is out on Lil' Chief in just a few weeks, and to celebrate the occasion Miles will be bringing his one man synth pop party to venues around New Zealand (accompanied by our own Princess Chelsea). In the meantime, head over to the "Listen" section of our (shiny and new) website to stream the album in its entirety, or place a pre-order here. For the super greediest fans, there's even a free download of the first single from the album, "Nervous". 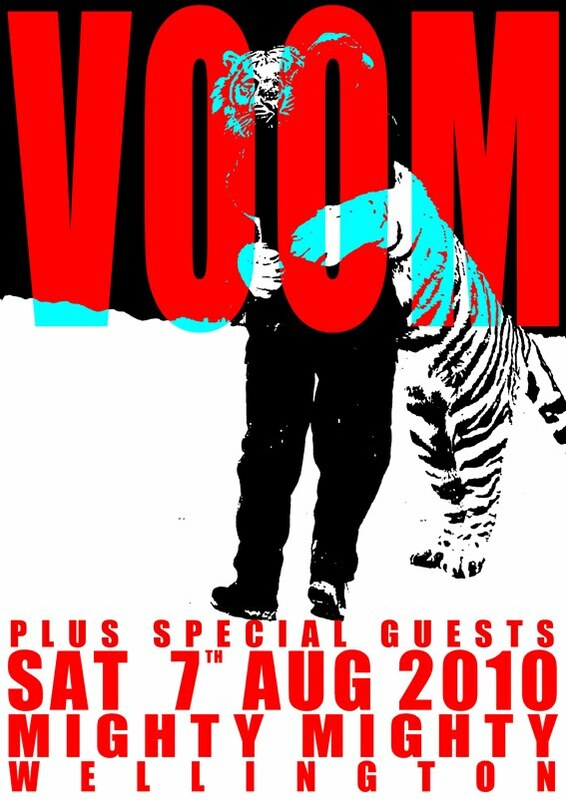 After watching Voom's music video for 'We're So Lost' below featuring two magnificent hamsters / guinea pigs - no doubt you'll want to make it to one of their upcoming shows. 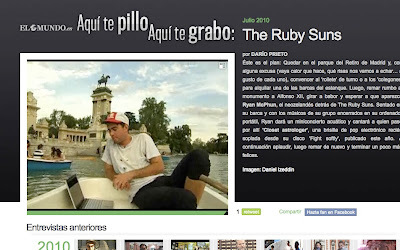 I promised I'd put our movies on-line a few years ago and finally I've gotten around to it. This one, The Making of Expervier, is the third in a series of improvised movies that we made. 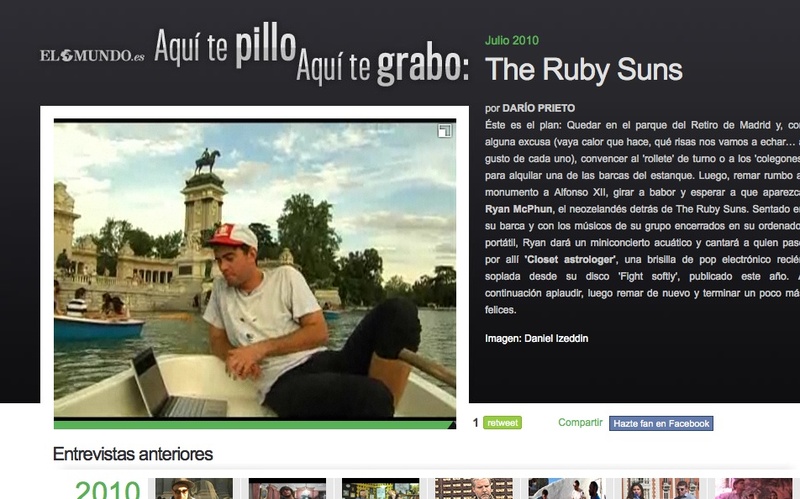 It documents us and our friends, as we make a movie about the launch of our home-made raft Expervier. It's on youtube in 5 parts but you can watch them all below. 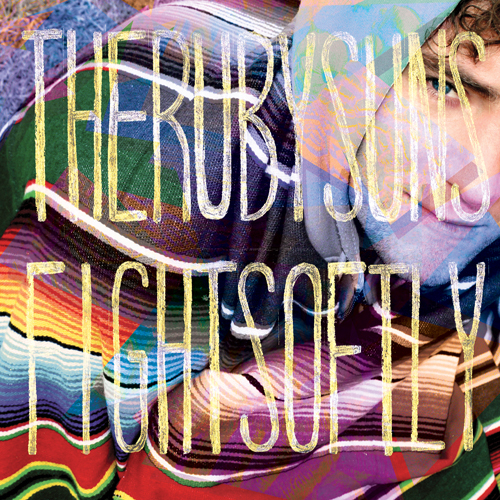 'Fight Softly' is the third album for Lil' Chief by pop masters The Ruby Suns. Ryan McPhun (their prime mover) has the kind of voracious musical mind that cites as equal influences '80s New Jack Swing and modern Angolan kuduro, the Beach Boys, Britney Spears, Brazillian tropicalia and Argentinean cumbia. He's the kind of diligent, meticulous soul that spends days hunched over a laptop in a tiny rented studio in Auckland just to perfect a sequenced drum track (mission accomplished). 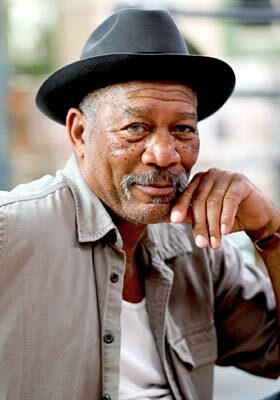 And Fight Softly is the kind of head-spinning combination of big-picture vision and sumptuous detail that only comes from an artist with an urgent need to express all the stuff he's seen. And you can dance to it! 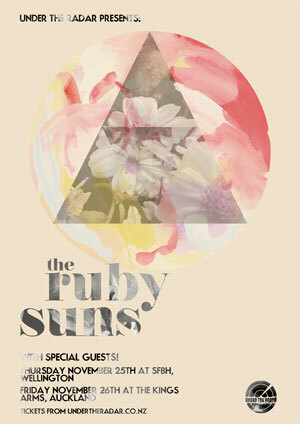 For the New Zealand winter months last year The Ruby Suns escaped to Seattle and began work on Fight Softly. "Mingus and Pike" is about their temporary Victorian abode and its happy-go-lucky pit bull mascot Mingus; “Cranberry” captures a day trip to Cranberry Lake, a dream of a swimming-hole 90 minutes from Seattle on Fidalgo Island. The former is beat-buzzed bedroom R&B swathed in reverb while the latter is part tequila-drunk marching band, part Eastern Bloc candy rave. The Ruby Suns also took a whirlwind tour of Europe that included 10 days at a friend's spread outside Szeged, Hungary. McPhun and friends Bevan Smith (Signer, Aspen, Skallander) and Matthew Mitchell (Skallander, Muriel Tsains) spent their time devouring veggie pizzas and jamming, improv-style, in an old farmhouse. These sessions didn't make it to Fight Softly as-is but were a springboard into new ideas McPhun brought back to his Auckland studio. Like "Closet Astrologer," a song that started in Hungary and concluded, vaporous and Vangelis-like, in New Zealand. Or "How Kids Fail," a multi-movement epic that sounds like a post-techno hymn and nods to How Children Fail, John Holt's groundbreaking book on the general out-of-touch-ness of the public education system. "Haunted House" bounces on a pitch-shifted vocal sample and bubbly synth line, simultaneously lush and minimal. "Cinco" and "Dusty Fruit" share a similar digital-tropical soul. This is where Fight Softly veers from the path set by its predecessor. Thematically, it's not as wide-eyed or lighthearted, picking apart the relationships faced as we pass through the world—with our surroundings, each other, ourselves. Sonically, it remains as beat-centric, though these beats are deliciously artificial—stretched and compacted and distorted beyond recognition. Melodies are scuzzy and digital, not many guitars strummed or basses plucked. McPhun's soulful upper-register croon, swallowed into the mix, replaces group chants and full-throated singalongs. Rather than an album of clearly-drawn influences, Fight Softly is a unique, inscrutable synthesis, more itself than anything else. If you'd like to purchase titles directly from Lil Chief, both our local and international online stores are open for business. The Best Lil' Chief You Tube Link in History? Leilani Heather is an Auckland based photographer who takes awesome photos. My friend Matthew showed me her website last year and then she contacted us to take some Gladeyes band photos.